OSWEGO – The school year came to an exciting close at the Fitzhugh Park Elementary School. During the final assembly one student, who displayed and showed PBIS qualities, was rewarded with a skateboard donated by Murdock’s of Oswego. 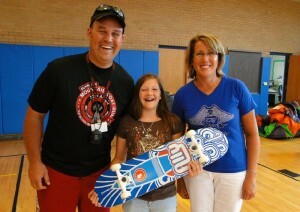 Sixth grader Courtney Dryden received the skateboard from Physical Education teacher Pat Bond and Principal Donna Simmons.